An excerpt from a new collection of writing and visual art by women from North East India. About three to four kilometre from Upar Deori Gaon, in the dense interiors lies a Mishing village. By the time I reach Mishing Gaon, it’s close to dusk and I see many young women riding back from school on their bicycles. “The LP School nearby has a field that becomes a water pool on rainy days, you did well by walking to arrive here”, says Mrs Biju Doley, a kind host who agreed to show me local beer preparations the following day. I rest with her children in their sang ghor, a raised stilted hut, and the delicious pork dinner keeps us all warm. 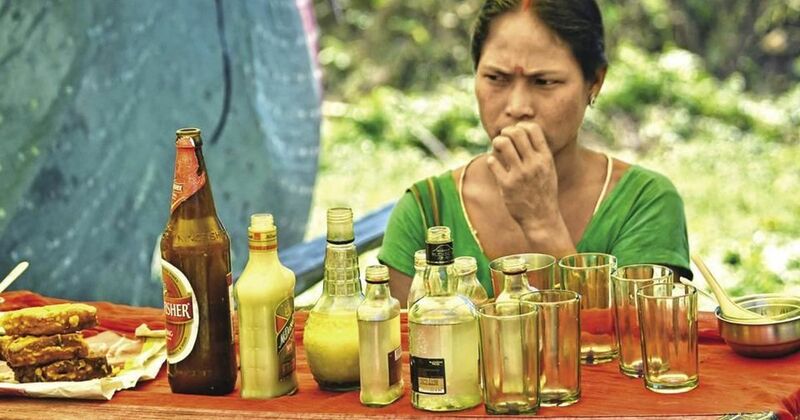 Early next morning, Biju introduces me to her female companions – mischief makers – and excellent apong brewers. Apong being their signature local drink, it has acquired a larger-than-life status in their festivities and rituals. All of them are young mothers (aged between 18-years-old to 20-years-old), carrying yelling infants on their shoulders and hips. They have accepted that domestic chores are their department and that even though men can learn how to brew, they do not do so. There are two kinds of apong: Nogin and Po:ro. For the Nogin apong, starter cakes called E’pob are made by crushing rice with medicinal plants, each providing a unique health quotient (and sweetness) to the drink. Biju also tells me that some flowers are used, though she doesn’t know their names. Cooked rice is laid out on leaves of banana or bamboo and after it cools, crushed E’pob is added to the rice. Then the entire mixture is put inside a pitcher or a plastic drum, the latter more commonly visible these days. I am told that in summer it may take upto 6 days for a proper fermentation. After that the mixture is filtered and the waste is used as pig or poultry fodder. 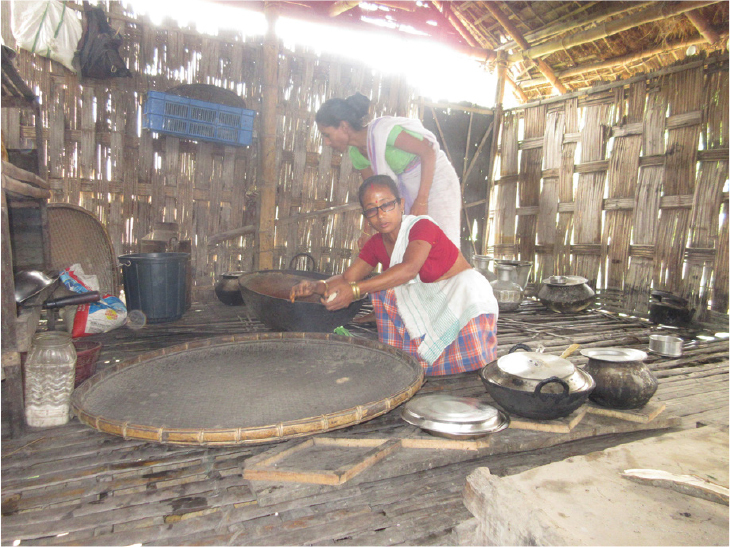 Biju and Mili both agree that it was after their marriages that they learnt how to brew apong. As Mili’s sister-in-law joins us, they tell me in chorus that in their natal homes, they picked up the rudiments of the process by observing their mothers brewing. But they hardly ever participated in the task, “jiwori kalot eman kora nohoi”. These experiences further throw light on how knowledge and labour skills are passed down orally and transmitted by women in order to facilitate the larger network of patriarchy, which they imagine holds them together. They act as mediators for community subsistence; brewing beer acts as a cathartic outlet from their everyday tasks. But, it can also be argued that such outlets are “permissible” only because any complete subversion might be crushed. In that respect, merry women producing better beer is a part of myth-making. Forms of carnival laughter such as this, are made available to women only temporarily because the fruition of counter-knowledge in the process is perceived as the real threat. When the women come together, there are small moments of transgression. Biju says, “In folk festivities, when the pressure is higher, we brew together to divide the labour.” Sisters from Majuli, Dergaon and other places fetch the herbs for the one who is too bogged down by chores to do so. “Even at 44, I am sturdy enough to go and cut firewood, not to mention that the urban ladies who come for Ali-i-ligang [harvest festival] order Sai Mod secretly. I have a fair share of fans from the city...” she laughs. It is usually believed that merry minds can brew better apong. So Biju and her companions remain in good humour while picking herbs. 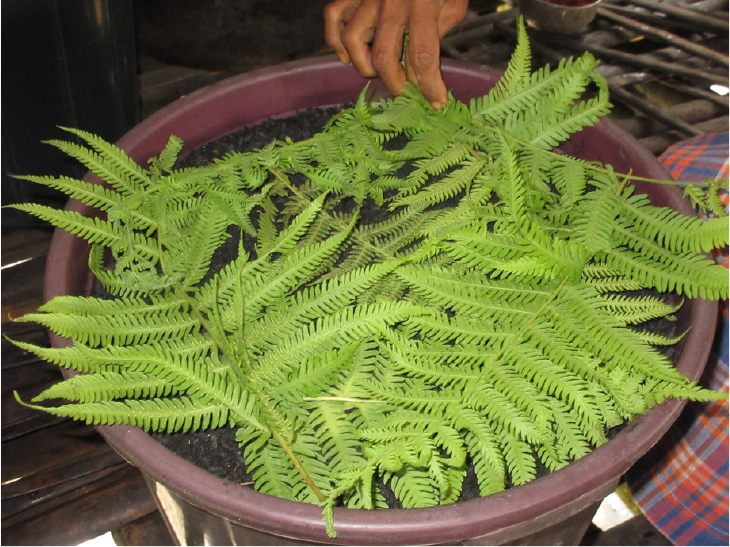 Plant knowledge and awareness is shared en route to the forest; herb gathering effectively allows an outlet from other kinds of laborious work. This is an area where women have mastered their skills with lived realities providing them better modes of survival as opposed to textual/formal learning (where there is hardly any room for teaching domestic skills). Their voices seep through these little uncared-for areas like picking herbs, making it a subterranean exercise of power. Other rules include keeping sour or bitter fruits, greens and menstruating women at bay, all of which are believed to turn the drink sour. Women are supposed to refrain from eating sour or bitter fruits and even farting while brewing. Biju says, “Initially, menstruating women were supposed to rest hence they were kept from working, but gradually this fact became more stringent, with the rest factor taking a backseat. Now my husband is irritated when I menstruate for he has to help with chores. 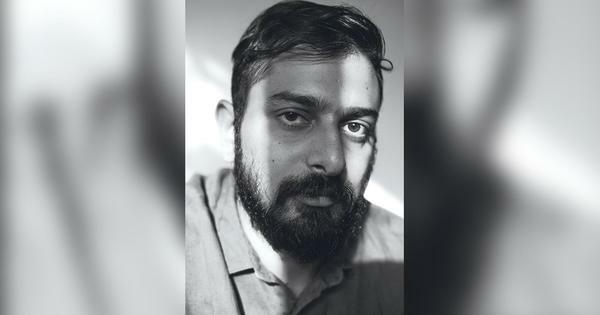 All these taboos are directly connected to the larger spectrum of gastronomic beliefs about purity and pollution.” It is worth noting that I got easy access to kitchen space, because I was “clean” and the women did ask me that question as I got closer. Apong khaute tika uluwa or to be bare-assed while consuming apong is a popular idiom among the Mishings – it alludes to the capacity of liquor to reveal the naked truth, as it were. if women are allowed to brew in public, it will make the gods angry. Female labour participation is therefore restricted and this ritual substantiates the rift between the public and the private. It is interesting to observe subversions by the women themselves in real life as opposed to the women being invoked in poetry and folk songs such as the one mentioned above. To an outsider, who is unfamiliar with the context of apong, these idioms and riddles act as a permanent conundrum. I recall one such situation, present in one of the first novels in Assamese about the Mishings – called Miri Jiyori – written by Rajani Kanta Bordoloi in 1892. This epic love story about Panei and Jonkey looks at the structure of civil society in those days. In chapter 13, Panei, the miri damsel, has to flee from the clutches of a “proper babu” (who is not the “rustic type”and “consumes English liquor”). He takes it for granted that because she consumes her ethnic rice beer (apong), she will give in to his amorous advances. 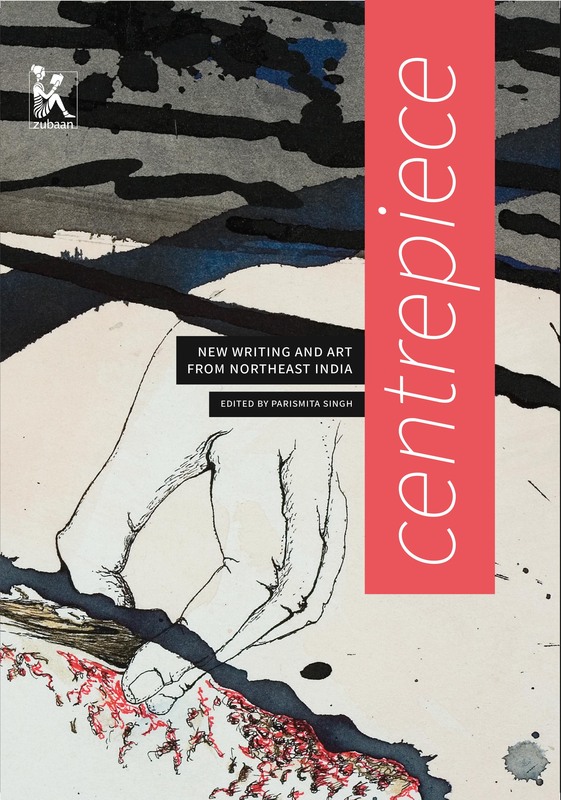 Excerpted with permission from “Hands That Brew”, by Rini Barman, from Centrepiece: New Writing And Art From Northeast India, edited by Parismita Singh, Zubaan Books.